It is that time of year when the weather turns wetter and windier windbreakers are the ideal solution to this problem. The video below shows is a mesh Windbreaker door,It allows air into the building without causing drafts and with good ventilation air quality is improved helping to keep livestock healthy and dry and helping to reduce veterinary and other bills . 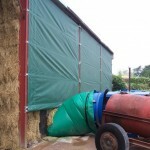 Also help to keep hay and straw dry cutting down on waste, the windbreaker door is safe and easy to open for the operator allowing ease of access to buildings on a regular basis, it requires no electrical wiring, this product can be installed by customers themselves keeping costs to a minimum. We have various other types of windbreakers to suit all types of buildings and requirements.We also manufacture Waterproof covers for Trucks,Rotary Mowers,Tarps,Machines etc. all manufactured to customer requirements. We don’t just supply waterproof covers we supply solutions to problems.